How Does Virginia Deal with Marijuana? Attitudes about marijuana are changing rapidly across the United States. Numerous states have legalized marijuana for recreational use. Many other states enable people to use marijuana for medical purposes, including Virginia. Outside of the medical context, however, marijuana remains illegal in Virginia. Any person who possesses, distributes, or manufactures marijuana can face serious criminal penalties under Virginia law. To understand the boundaries of these offenses, the following sections will examine specific marijuana laws and penalties in Virginia. Under Code of Virginia Section 18.2-250.1, it is unlawful to possess marijuana in the absence of a valid prescription. There is a knowledge requirement to this offense. A person must know, or have a reason to know, that they are in possession of marijuana. Otherwise, it does not qualify as possession under Virginia law. Second or Subsequent Offense — Results in Class 1 misdemeanor charges and a punishment of up to 12 months in jail and $2,500 in criminal fines. Under Code of Virginia Section 18.2-248.1, it is unlawful to distribute, sell, or gift marijuana. It is also unlawful to possess marijuana with the intent to distribute, sell, or gift. In either case, it is a crime to engage in marijuana distribution or attempted distribution in Virginia. More than 5 pounds — Results in felony charges and a punishment of five to 30 years in prison. Under Section 18.2-248.1, it is unlawful to manufacture or grow marijuana. It is also unlawful to possess marijuana with the intent to manufacture or grow. This means that it is a crime to engage in marijuana manufacturing or attempted manufacturing. 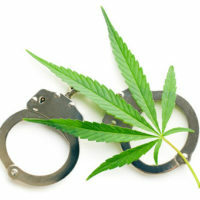 If a person manufactures marijuana, or possesses marijuana with the intent to do so, they are subject to felony charges. The potential punishment includes five to 30 years in prison and up to $10,000 in criminal fines. If you have legal questions about marijuana crimes in Virginia, it is wise to speak with a trusted criminal defense attorney. The attorneys at Simms Showers LLP have the skill and experience needed to fight various criminal charges, including marijuana possession, distribution, and manufacture. If you need legal help with criminal defense, contact us today for a free initial consultation.